Elk is a plugin for Grasshopper running in Rhino. Elk works with .osm files exported from openstreetmap.org to extract 3D modeling data from public map data. 1. Download Elk from food4rhino (you will need an account). 2. Follow Elk’s installation instructions. 3. Restart Rhino and Grasshopper. Verify that Elk has installed properly. 4. Use openstreetmap.org to identify and Export your site as an .osm file. Save the .osm file in a known location. 7. Insert a Number Slider. Edit its values as follows: Name: Height. Rounding: Integer Numbers. Numeric domain: Minimum: 1. Maximum: 10. 9. Connect the components: Connect the R output of Multiplication to the N input of Series; connect the S output of Series to the Z input of Vector XYZ; connect the V output of Vector XYZ to the T input of Move. 11. Insert a Panel component. Edit its value to equal 2, and connect it to the B input of Multiplication. 12. Copy-paste this entire group of components (i. e., Panel, Multiplication, Series, Vector XYZ, and Move) and set the new components below the original ones. 13. Connect the components: Refer back to the earlier components we placed. 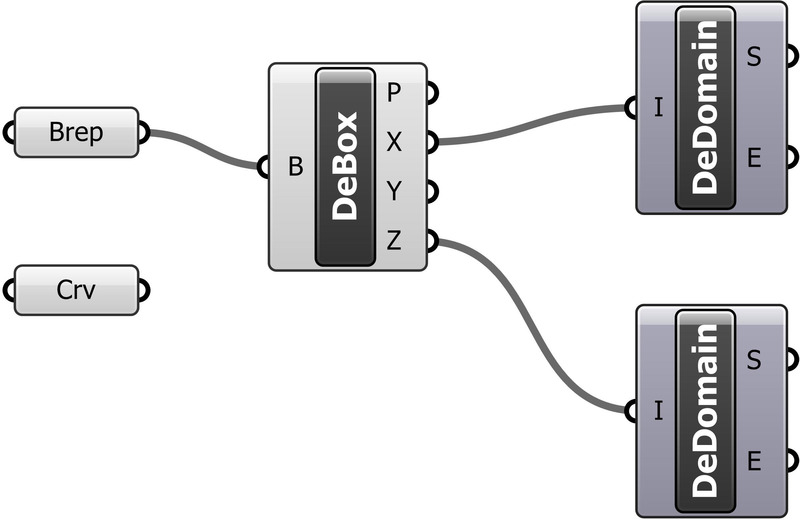 Connect the R output of the second Subtraction component to the A input of each of the Multiplication components (two connections). 14. Connect the components: Again referring back to the earlier components we placed, connect the output of the Number Slider to the C input of each of the Series components (two connections). 15. Insert a Division component. Connect the L output of the Length component (i. e., the Length component which measures the length of the Rhino curve) to the A input of Division. Connect the R output of the first Subtraction component to the B input of Division. 17. Connect the components: Panel output to the B input on the Division and Multiplication components; R output of Division to N input on Series; R output of Multiplication to C input of Series; S output of Series to L input of Shift List; L output of Shift List to L input of Cull Nth. 18. Refer back to components placed earlier. Connect the R output of Division (i. e., the Division component connected to the Length component) to the A input of the Multiplication component. 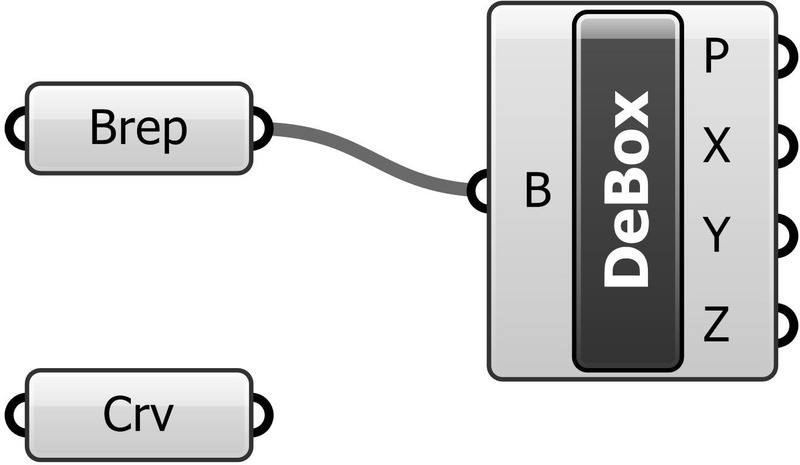 Connect the R output of Subtraction (i. e., the first Subtraction component, connected to the Deconstruct Domain component) to the A input of the Division component. 19. Insert a Series component. Connect the R output of Subtraction (i. e., the Subtraction component referred to in the preceding step) to the N input of Series. Connect the R output of Division (i. e., the same Division component referred to in the preceding step) to the C input of Series. 21. 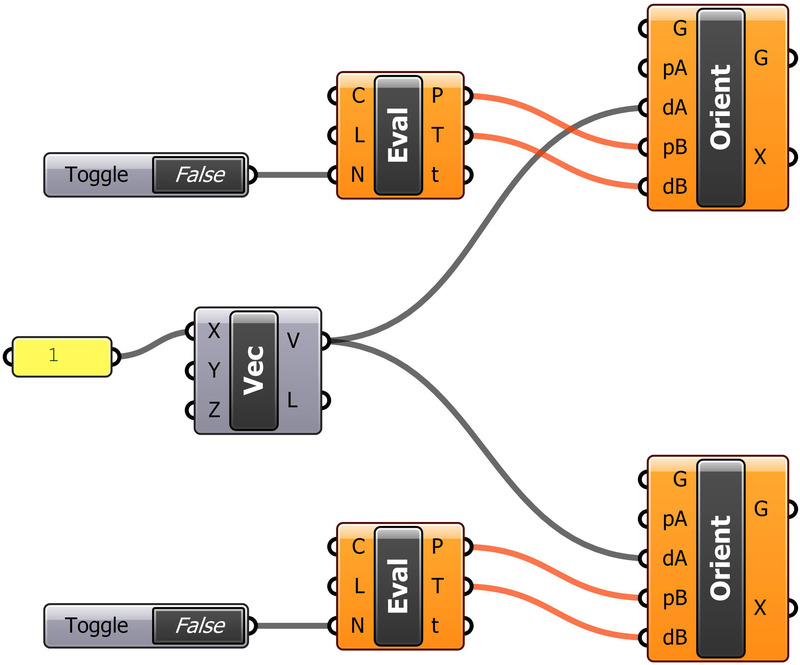 Connect the components: Output of Boolean Toggle to the N input of Evaluate Length; P output of Evaluate Length to the pB input of Orient Direction; T output of Evaluate Length to the dB input of Orient Direction. 22. 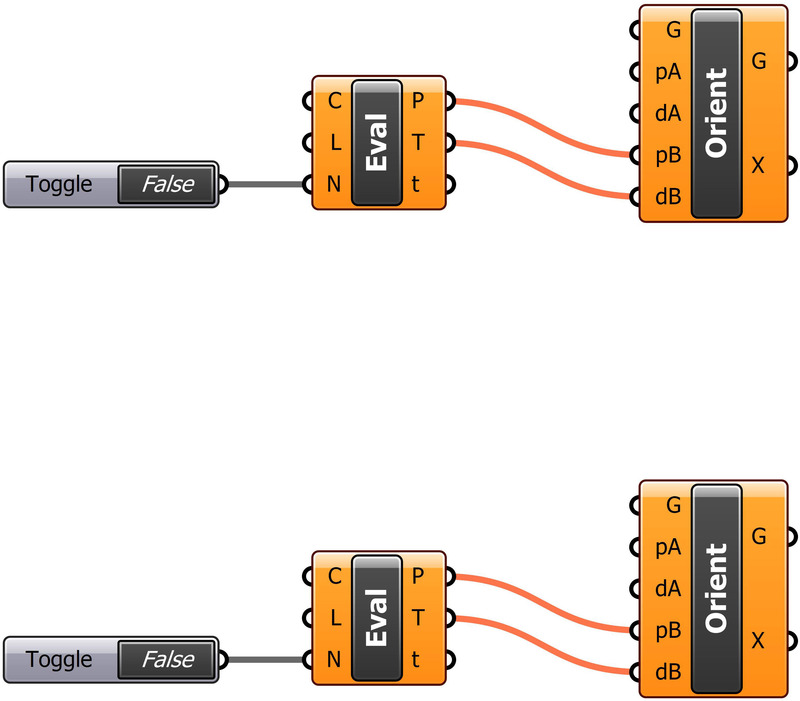 Copy-paste this entire group of components (i. e., Boolean Toggle, Evaluate Length, and Orient Direction) and set the new components below the original ones. 23. Insert the following components: Panel (value of 1) and Vector XYZ. Connect the output of Panel to the X input of Vector XYZ, and connect the V output of Vector XYZ to the dA input on each of the Orient Direction components. 24. Refer back to components placed earlier. 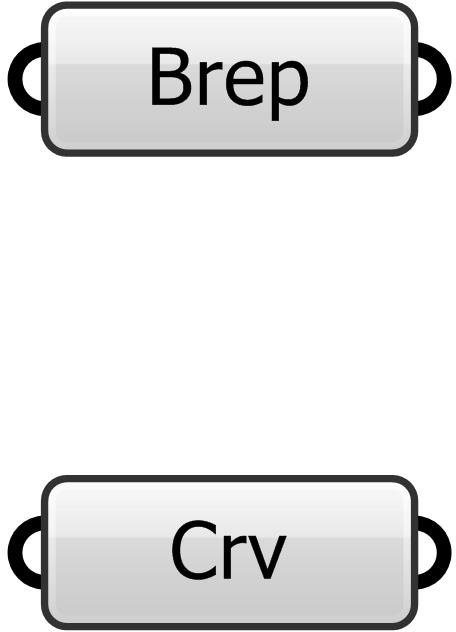 Connect the Brep (Rhino “brick”) output to the G input on each of the Orient Direction components. 25. Connect the S output of Series (i. e., the Series component placed in step 19) to the L input of the first Evaluate Length component). 26. Connect the G output of Move (i. e., the Move component placed in step 8) to the C input of the first Evaluate Length component). 27. Connect the L output of Cull Nth (i. e., the Cull Nth component placed in step 16) to the L input of the second Evaluate Length component). 28. Connect the G output of Move (i. e., the Move component placed in step 12) to the C input of the second Evaluate Length component). 29. Connect the R output of Subtraction (i. e., the Subtraction component placed in step 5) to the S input of Series (i. e., the Series component placed in step 12). 30. 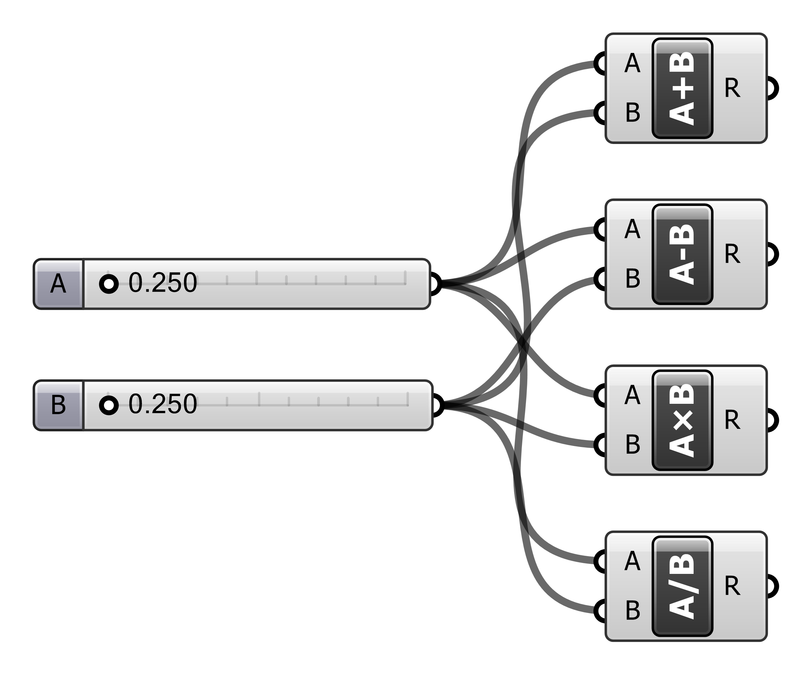 Finally, connect the output on the Crv parameter (i. e., the Rhino “path”) to the G input of each of the Move parameters (i. e., the Move parameters from steps 8 and 12). 31. The definition is complete. 1. 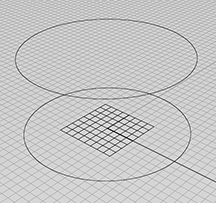 In Rhino, use the Curve command to draw an arbitrary curve in 3D space. 3. Insert the Curve parameter. 4. Right-click on the Curve parameter and choose Set one curve. Click on the curve you drew in Rhino. 5. Right-click on the Curve parameter and choose Reparameterize. This forces Grasshopper to measure values along the curve starting with 0 and ending with 1. 6. Insert the Divide Curve component. 7. Insert a Number Slider. 8. 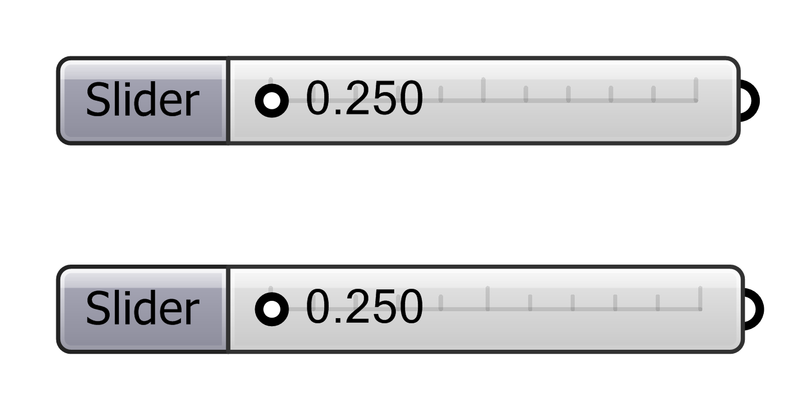 Edit the Slider values: Under Slider accuracy, set Integer Numbers. Under Numeric domain, set 1 as the Min and 20 as the Max. 10. Insert the Circle CNR (Center-Normal-Radius) component. 12. Insert a Loft component. 14. Insert the Graph Mapper component and another Number Slider. 15. 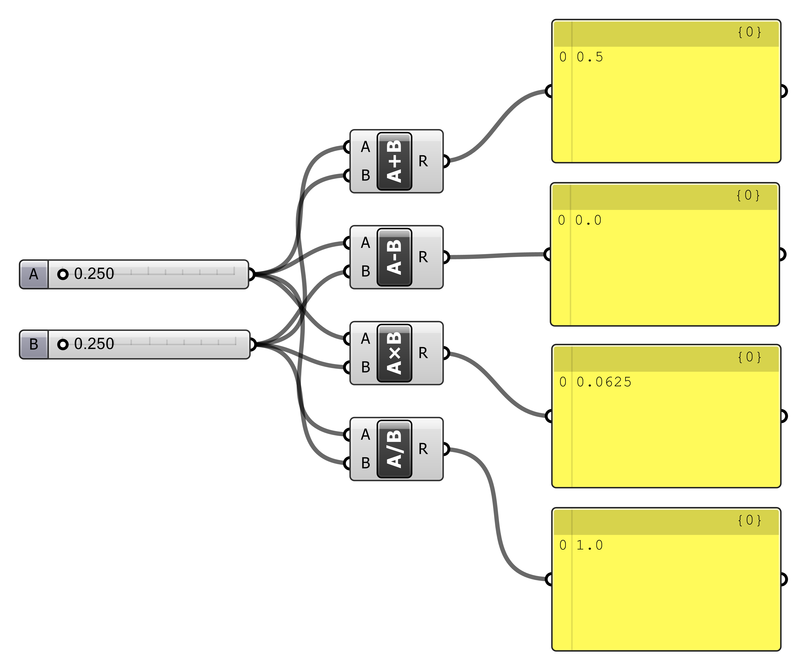 Right-click on the Graph Mapper component. 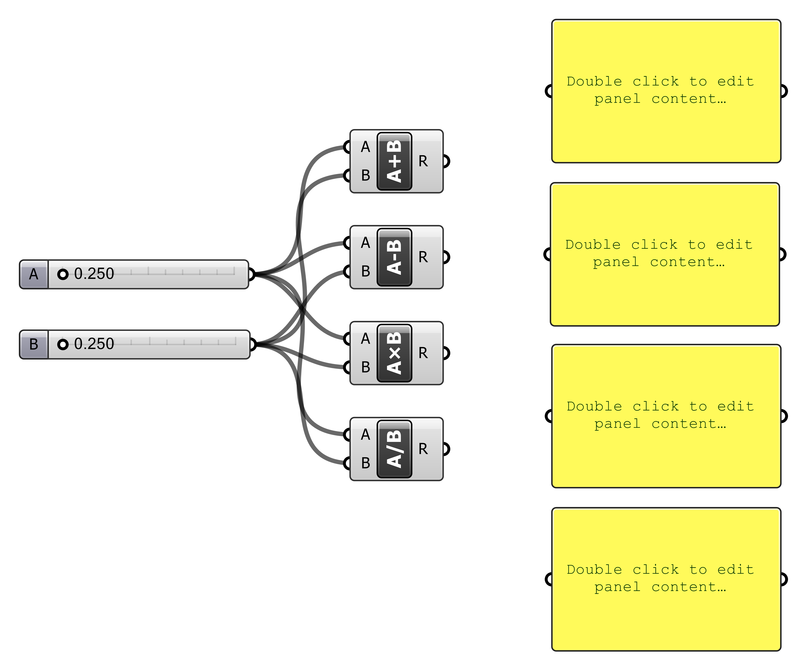 From Graph types, choose SinC. 16. 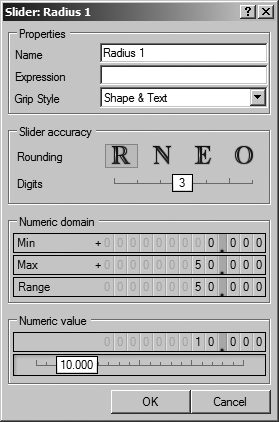 Edit the Slider values: Under Numeric domain, set 1 as the Min and 50 as the Max. 17. Insert the Multiplication component. 20. The Grasshopper definition is complete. Experiment by (1) selecting different curves from Rhino; (2) changing the number of divisions (first Number Slider); (3) changing the shape of the graph in the Graph Mapper component (move the grips); (4) changing the graph type in the Graph Mapper component; (5) changing the multiplication value (second Number Slider). 1. Start Rhino; type Grasshopper at the Command prompt. 2. In Grasshopper, choose File > New Document. 3. 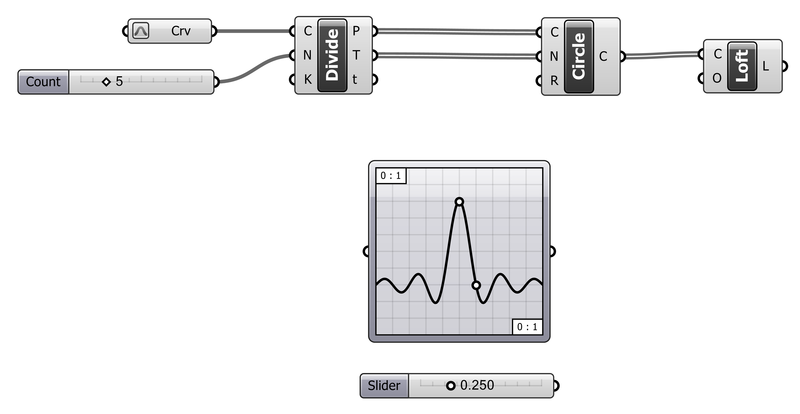 Double-click anywhere in the Grasshopper canvas to search for the Number Slider component. 4. Insert a Number Slider into the Canvas. 5. Double-click on the Slider component to edit its properties. 6. 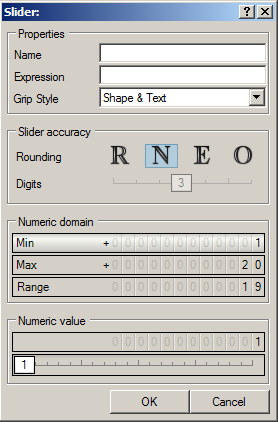 Under Numeric Domain, set the “Max” value to 100. 8. Single-click on the Slider and copy it to the Clipboard (ctrl-C). 9. Paste the Slider (ctrl-V). 10. Arrange the two Sliders vertically. 11. 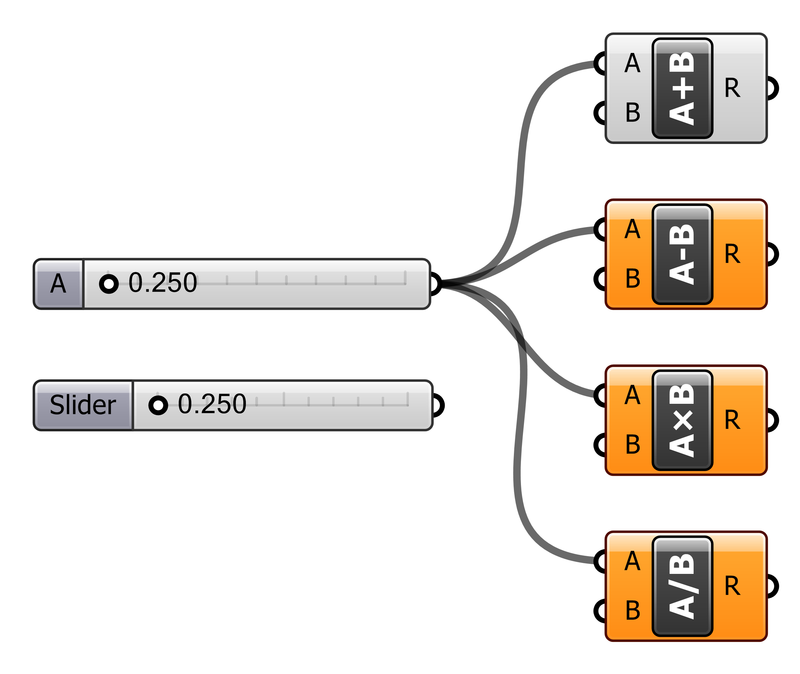 Double-click anywhere in the Grasshopper canvas to search for the Addition component. 12. Insert the Addition component into the Canvas. 13. Repeat the previous two steps with the Subtraction, Multiplication, and Division components. 14. 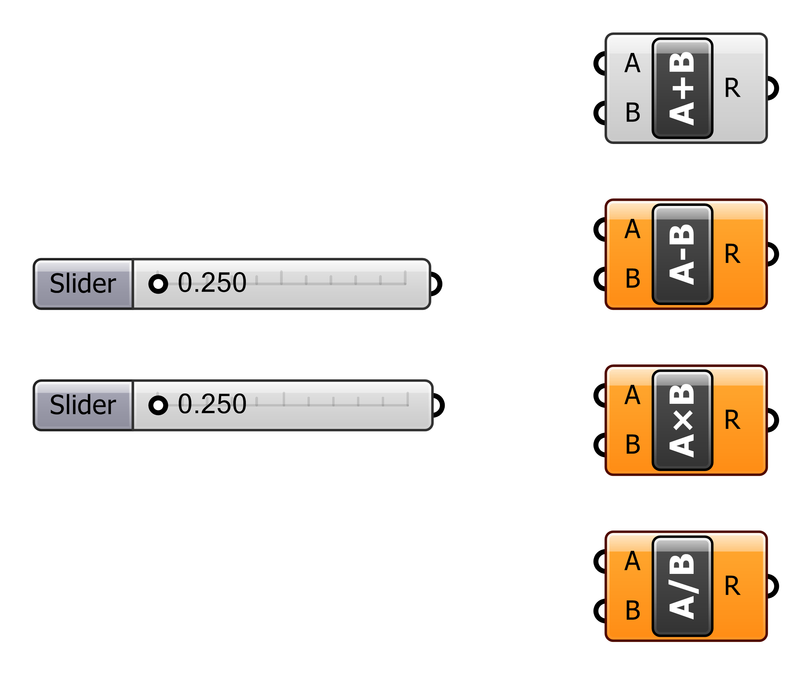 Connect the first Slider to the “A” inputs of the components. Notice that the Slider automatically updates its label to “A”. 15. Repeat the previous step with the second Slider and the “B” inputs. 16. 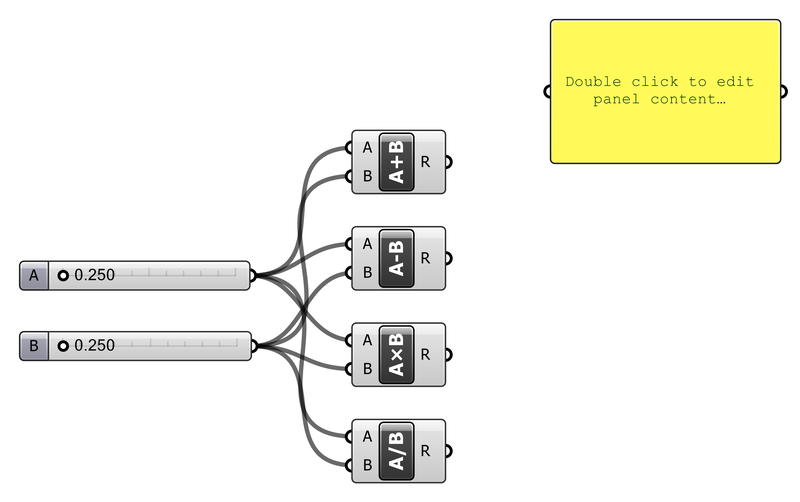 Double-click anywhere in the Grasshopper canvas to search for the Panel component. 17. Insert a Panel into the Canvas. 18. Single-click on the Panel and copy it to the Clipboard (ctrl-C). 19. Paste the Panel three times (ctrl-V). 20. Arrange the four panels vertically. 21. 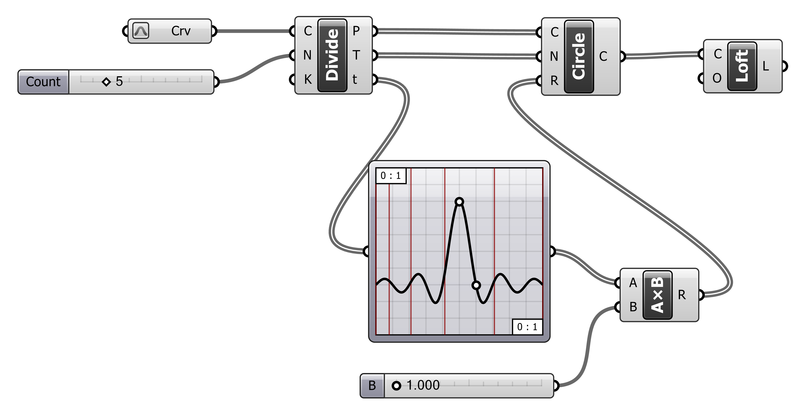 Connect the “R” (result) outputs from the Addition, Subtraction, Multiplication, and Division components to the inputs on the panels. 22. The Grasshopper definition is complete. Experiment with adjusting the two sliders and observe the results. Creating Grasshopper definitions is rarely a straightforward, linear process. It usually involves having a general idea of what one wants to accomplish, and a sense of which components will be necessary; however, the process almost always involves extensive testing, false starts, discoveries, and iterations along the way. One way of creating this definition is shown in the following step-by-step procedure. 1. Start Rhino; type GRASSHOPPER to start Grasshopper. 2. 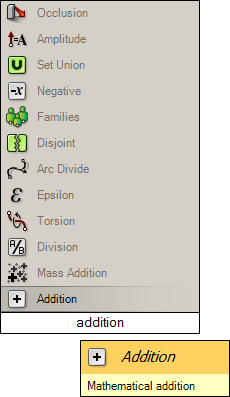 Double-click in the Grasshopper canvas to search for and insert the Ellipse component (or Curve > Primitive > Ellipse). To see the component’s default values, hover the mouse over the input labels (P, R1, and R2). P, the base plane, is by default the XY plane and is previewed as a red grid in Rhino. R1 and R2, the ellipse’s two radii, are be default both set to one (1.0). Their result is previewed as a red circle in Rhino. However, we want the component to produce variable-sized ellipses. Therefore, we need to introduce variable input in the form of number sliders. 3. 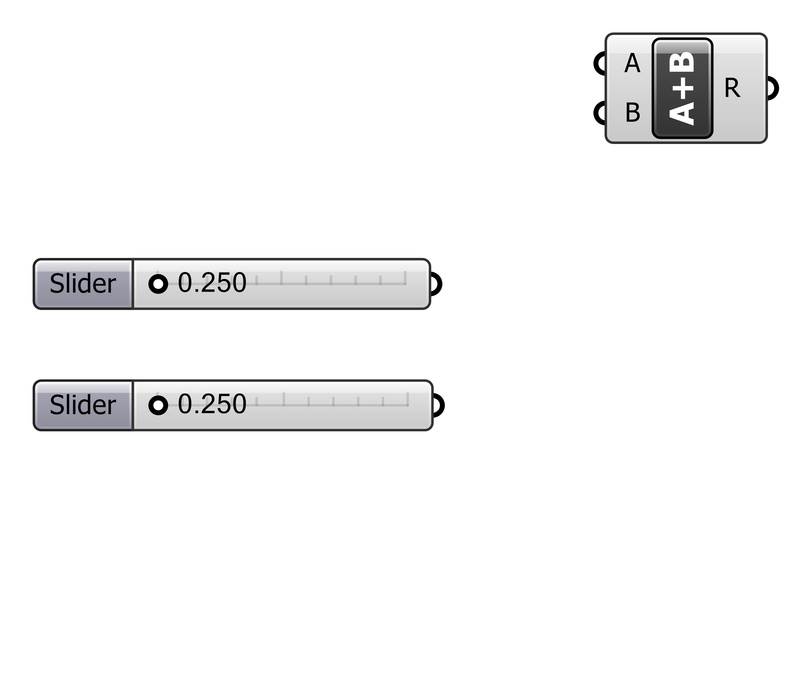 Double-click in the Grasshopper canvas to search for and insert the Number slider component (or Params > Input > Number Slider). This will allow the slider to generate values between 0 and 50, with a precision rounded to three decimal points. Its initial value is set to 10, but that value is variable. 5. Copy and paste the first slider to create another slider. Double-click on this slider and change its name to Radius 2. 6. Connect the two sliders to the Ellipse component by dragging wires between them. 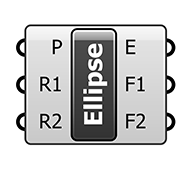 Begin by clicking on the slider output node, hold down the mouse button, and release it on the input node of the Ellipse component. The ellipse is now shown with radii of 10 units. Adjust the number sliders to see how the preview is affected. 7. 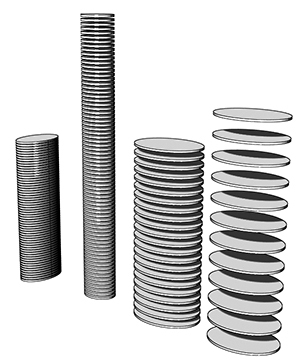 Having created a base ellipse of variable size, we now need to begin stacking multiple copies of the ellipse. We’ll do this by copying the ellipse vertically. Grasshopper does not have a Copy component; instead, we use the Move component — with the knowledge that the original ellipse will still preview in its original location. The Move component requires two forms of input, which you can see by hovering the mouse over the input labels (G and T). 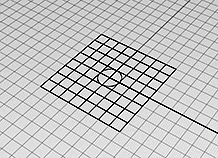 Input G (Geometry) requires a drawn or modeled object — such as an ellipse. Input T (Motion, or Translate) requires a direction/magnitude in the form of a vector. Notice that by default, input T is set to a vector 10 units long in the Z-direction (0.0,0.0,10.0). A new ellipse is previewed 10 units vertically above the original ellipse. However, we need multiple ellipses, placed at a variable distance (i. e., floor-to-floor height) above the original ellipse. We will need to do something different for the T input on the Move component. Specifically, we will need to provide to this component as input a list of numbers corresponding to the vertical positions of the floors. The Series component generates a list of numbers according to input parameters. Hover the mouse over the input labels (S, N, and C) to find out what is required for input. 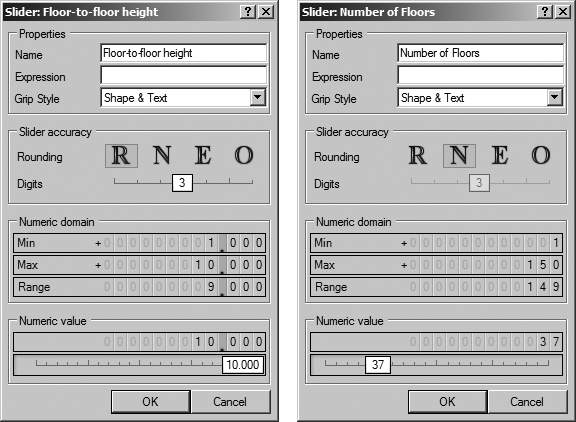 The N input refers to the step size — the floor-to-floor height. And the C input refers to the count of items in the list — simply, the number of floors in the tower. Both N and C can be controlled with number sliders. The problem is that the Move component expects vectors as input at T; we have given a list of numbers, not vectors. To fix this, we need to insert a Unit Vector component between the Series and Move components. Adjust all four number sliders to see the effect on the Rhino preview. Constructing a “skin” on the tower.